A joint research team from Southern Illinois University and Shedd Aquarium in Chicago has recently taken on the mystery of the elusive mudpuppy. Their study, published in the Journal of Great Lakes Research in December, provides some answers. The mudpuppy is a fully-aquatic salamander thought to be on the decline–though the extent of that decline is unknown. The foot-long amphibians are classified a “threatened species” in the state of Illinois and considered a concern throughout the Great Lakes region. Philip Willink, a senior research biologist at Shedd, said that mudpuppies used to be a common sight to fishermen in the area just one century ago. Such accounts are rare today. Destruction and degradation of habitat, along with invasive species, are spelling doom for mudpuppies. Misinformed fishermen have been known to kill the few they come across, thinking them poisonous or detrimental to fishing. Mudpuppies are also very sensitive to pollution. That characteristic could make them especially important to researchers. Mudpuppies tend to disappear in streams with high levels of pollution. In other bodies of water, they absorb toxins and store them in their tissues. Population statistics and tissue samples could clue scientists in on the effects pollution and habitat degradation are having on those environments. But almost no population data exist on mudpuppies. “Everyone thinks we know everything about the Great Lakes, but in reality, there are a lot of mysteries still out there,” Willink said. Mudpuppies are one of those mysteries. Sightings are rare, and they have a reputation as being difficult to catch. They’re also strange looking–brown with large red frills. Alicia Beattie, a former master’s student at Southern Illinois University, led the project with Shedd Aquarium. She was assisted by Willink and Matt Whiles, a professor at the university. In order to unravel the mystery, they had to figure out how to capture the notoriously elusive creatures. But the team ended up with a pleasant surprise. Willink said that their capture numbers indicated a larger mudpuppy population than they would have expected in the region. Mudpuppies disappear during the warm months. They prefer cold water, evidenced by the research team’s lack of capture success in water warmer than 14 degrees Celsius, or about 57 degrees Fahrenheit. 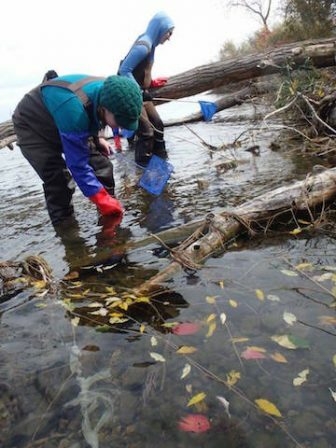 Researchers had to venture out during colder months with hand nets and modified minnow traps to find mudpuppies. 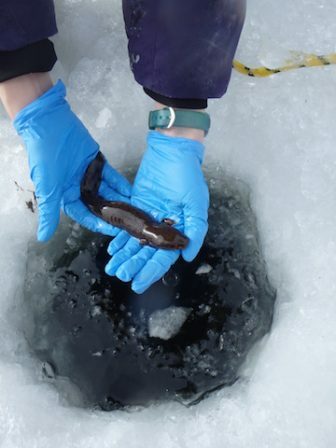 A few theories exist on why the mudpuppies are active in the cold. They could be increasing their activity during a time when many predators, and prey, are sedentary. But no one knows for sure. And no one knows where they go. It’s possible that they retreat into the deeper, cooler waters during warmer months, Willink said. But further research is needed. This study has laid some necessary groundwork. The team was able to assess effective capture techniques for the first time. The discovery that trapping should take place in the winter is especially critical for future researchers. They were also able to learn about the mudpuppy’s diet–which consisted of pretty much anything that would fit in their mouth, according to Beattie. Researchers performed stomach flushings of captured mudpuppies and recorded what came up. 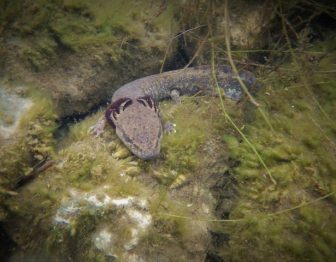 They found that some of the salamanders snacked on invasive species like zebra mussels and round gobies. They even found evidence of cannibalism. One of the larger specimens had eaten a juvenile. While this sort of thing is not uncommon in amphibians, according to Beattie, it was previously unconfirmed in mudpuppies. All of these discoveries set the stage for future studies, like the project Shedd Aquarium is hoping to begin soon with the help of a new Ph.D student from Southern Illinois University. “We were just trying to fill in gaps that are going to help inform the management and conservation of mudpuppies. That was our goal,” said Beattie. Editors note: This story was edited Jan. 25 to accurately name the process of stomach flushing.